This small knob will fit onto a standard potentiometer knob to provide a more aesthetically pleasing look and an easier grip. The single adjustment indicator line helps in determining adjustment position. .63" (16mm) Diameter X .59" (15mm) Height. This knob is designed for a sleeker look, an easier grip, and a more accurate adjustment for potentiometers. The single position indicator line removes ambiguity in determining adjustment position. Meet Mr. Rehak, an 80 year old (2012) bright CNC Machine enthusiast. 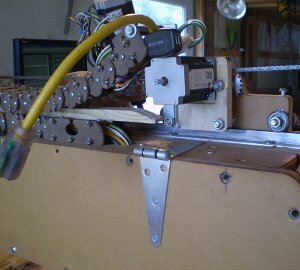 Jack built his blackFoot CNC machine in short time considering his available resources. Jack's modifications to his blackFoot are quite inspirational and worth a look. Moreover, Jack has set-up a very inventive workspace and resources to handle the various tasks such as loading sheets, hose/cable management and means of control. We recently paid a visit to Chad Gehring over at the Children's Museum to check on how his blackFoot 4x8 build was going. Watch the video to see Chad's machine and how he was able to mount his redLeaf.